The basic biology of erbB-2 and its participation in colorectal cancers. Mycobacterium tuberculosis - the 10 years of epidemiological and diagnostic studies. Distribution of amhpibians and reptiles in central Poland: 1980-2000. Sexual celection in the Swalow Hirundo rustica - A review. Biological research of Grabia River - fifty years of activity. 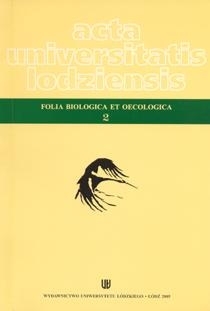 Materiales of the Polish flora in the Herbarium of the University of Łódź. Part XIX. Adoxaceae, Alismataceae, Araceae, Aristolochiaceae, Asclepiadaceae, Balsaminaceae, Butomaceae, Gentianaceae, Hippuridaceae, Hydrocharitaceae, Lythraceae, Menyanthaceae, Scheuchzeriaceae.